Home By Heidi: And The BABY is....Take Two!! And The BABY is....Take Two!! I couldn't take it ANYMORE....I had to find out what this baby was, waiting 2 more weeks seemed like FOREVER! So, I convinced my husband to make a super quick trip to Salt Lake with me and pay to find out this baby's gender, from one of those fetal photo places. I am soooo glad that I did. So worth the trip! Do you all want to know what were having??? The majority of you by 83% were RIGHT!!!! My oldest, Megan (10), was so full of emotion! She cried with joy throughout the day every time she thought of TRULY having a little sister. My 7-year-old son said he wanted a girl, but honestly I don't think he cared either way:) He was just excited to see the baby and its tiny feet and hands on the ultrasound. My 3-year-old spent the day with family! Well there you go! We are SUPER excited!!! Congratulations on another little lady! Congratulations! We may find out in a week at my 18 week appt! So nervous! This is our first. Congratulations! I just had my first daughter, and little girls are a JOY (as you know!). 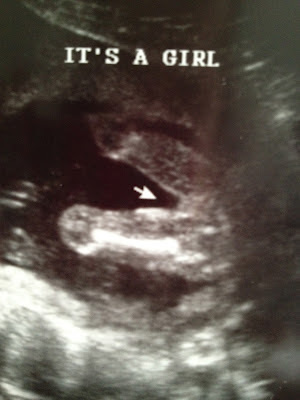 Glad that baby is healthy... and female! Can't wait to see what you do for her!! !